Bar code readers | Ardpol sp.j. Shown for the first time at the EXPO 2000 in Hannover. Great design is a feature of this product, which primarily attracts attention. The scanner can work on the stand and then it automatically turns on and sends out the read code when it is in the reading field. After removing from the stand, the code reading proceeds in a slightly different way. 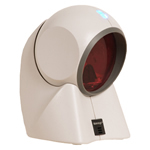 The reader begins to automatically emit a laser beam as it does when working on the stand, while the reading itself requires pressing a button located on the upper part of the scanner housing. The solution used is invaluable when the packaging contains several codes in close proximity to each other. In this case, the reading is precise and you can only select the code that is actually to be read. Like the MS9540, this reader is also a laser reader. External structure, functions and equipment are exactly the same for both types. The exception to the MS9540 is the lack of a trigger button that reads automatically in the MS9520. This will be the best choice when you need a laser hand-held scanner to read individual codes on the packaging. Most often, such requirements are posed on bar code readers used in retail trade. 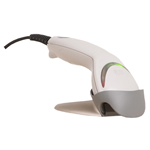 The parameters of this scanner, its functional values and the price offered seem unbeatable at the moment in the group of laser hand-held readers present on the Polish market. Interface: Keyboard or RS232 input of a computer or cash register. The latest and cheapest manual laser reader in our offer, produced by Metrologic. It is very light. It is also characterized by low energy consumption for laser scanners. This scanner is equipped with a code release button. The laser beam appears automatically when the plane with the code placed on it appears in front of the window. The reading is possible only after pressing the button. There is no automatic code reading mode. The set also does not have a stand. The advantages over CCD scanners are a wider range of reading distance (0 to 140) mm and the associated with this possibility of reading wider codes. Projection reader of the highest class adapted for vertical mounting. It can be equipped with a flexible stand. Designed for work in large stores and supermarkets, where the amount of space available limits the use of a rack reader. Flexible stand, allows you to easily adjust the location of the scanner to the requirements of the cash desk. Cheap laser, barcode reader. It scans the code using a 20-ray laser beam network and is designed to be embedded in any device that requires the use of a bar code reader. It is equipped with an RS232 interface. It can work in any position. Interface: RS232 input of a computer or cash register. A new laser universal reader with a spectacular casing. Fast and reliable reading of the code is ensured by a grid of 20 laser beam lines. It can be fixed, for example, to a table top, or stand on its own tripod and, if necessary, be used as a manual. Interface Keyboard or RS232 input of a computer or cash register. A new laser barcode reader of the highest class designed for vertical mounting. Available with RS232 and keyboard interface, and USB (special order). 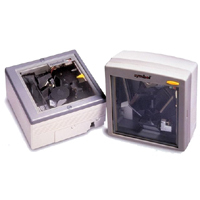 It is equipped with an additional RS232 port enabling the connection of additional devices such as a hand-held barcode reader, a magnetic card reader, etc. It requires little space for installation. The dimensions of the foot intended for this purpose are 64 mm x 64 mm. The new laser barcode reader of the highest class designed for mounting in a counter of sales positions. Available with RS232 and keyboard interface, and USB (special order). It is equipped with an additional RS232 port enabling the addition of extra devices such as a hand-held barcode reader, a magnetic card reader, etc. There are different versions of this type of reader equipped with panes with three different degrees of hardness (scratch resistance). 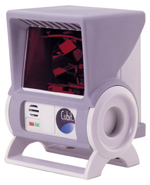 Represents a family of top-class laser readers for horizontal assembly in a counter. Types MS2021 with a depth of 508mm and type MS2022 with reduced dimensions (depth 420mm) allow simultaneous reading of the code from the five sides of the packaging. They emit 6000 laser scanning lines in a second. These lines are emitted synchronously by two separate, interlocked systems forming a grid of 68 lines. Failure of one of these systems allows you to use the second one until the failure is removed. They allow reading low quality and torn codes. They work with the RS232 interface. They are equipped with an antenna to deactivate EAS anti-theft tags. The cheapest manual laser reader in our offer, produced by Metrologic. It is equipped only with the automatic code reading mode – it does not have a code trigger button. The manufacturer also does not plan to use the stand. The RS232 version comes with a power supply unit. 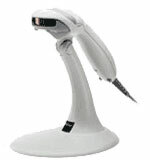 Barcode reader adapted for vertical mounting. Scans the codes using a 16-line laser beam grid. Due to the vertical assembly system, it takes up little space. It is worth using in specialist stores such as, for example, drugstores, footwear etc. and in medium and large grocery stores. Interface:	 Keyboard output, RS232 for computer or cash register. LS 2208 is a handheld, laser barcode reader designed to work wherever high-quality reading is needed at a reasonable price. Series 2200 readers are among the best in the point-and-shoot segment (“aim and shoot”); they are faster, smaller and have a greater range than competitive products. They are also distinguished by a modern, ergonomic and light construction. The LS 2208 is good in the hand and is easy to use even for those with small hands. Lightness and ergonomics of the structure minimize hand fatigue when using a reader. The effect is to increase work efficiency in both commercial and storage applications as well as in office work. The great advantage of the reader is also the high resistance to physical damage, such as a fall from the shop counter to the floor – the LS 2208 is resistant to impacts and multiple fall from a height of 1.5 meters. Standards and certificates: Certified to UL1950, CSA C22.2 No. 950, EN60950/IEC950, FCC Part 15 Class B, ICES-003 Class B, European Union EMC Directive, Australian SMA, Taiwan EMC, Japan VCCI/MITI/Dentori. The cheapest reader in our offer. It has the advantages of CCD readers, ie low power consumption, high tolerance for ground colors, from which the code is read. The scanner cable is permanently built-in. Triggering the reading is possible only by means of the button. For both RS232 and keyboard versions, the mains power supply must be purchased separately. Due to the low energy consumption, which is generally characterized by CCD diode readers, this need is rare. Interface: Keyboard output, RS232 for computer or cash register.